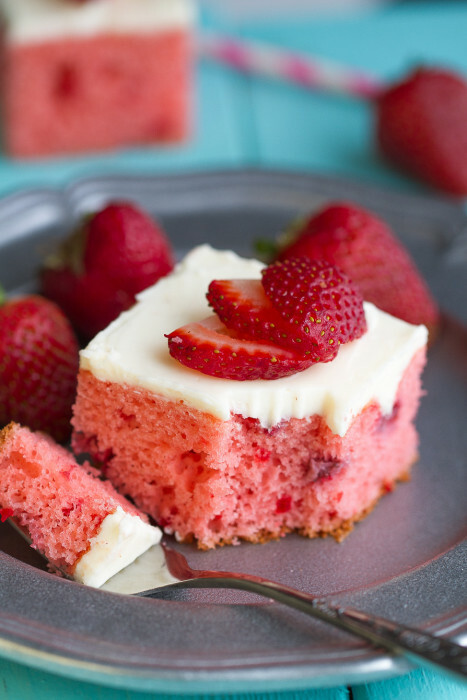 Strawberry Frosted Sheet Cake is a perfectly light and fluffy strawberry cake and best of all, it’s made from scratch with NO cake or jello mix. 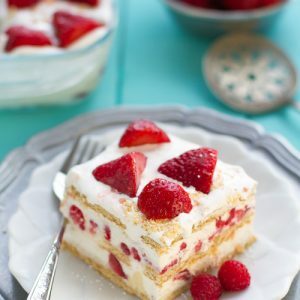 It’s full of fresh and freeze-dried strawberries and topped with an easy buttercream cream cheese frosting. Even though summer is slowly winding down, I am still not ready to let go of strawberries. As much as I love all summer fruit, there is just something about strawberries that makes my world go round. Strawberry picking was on our summer bucket list but it’s been so busy that we sadly missed out on getting around to it this year. So I did the next best thing I could think of, I stocked up on fresh local strawberries when I spotted them for a great price last month and have been adding them to salads and as many desserts as I possibly can. 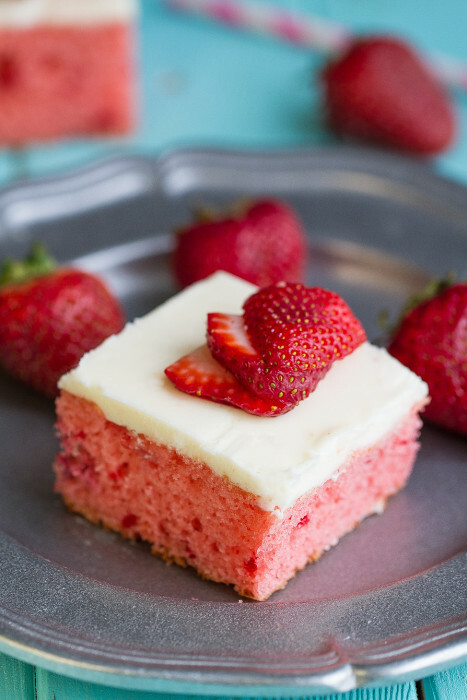 I made this Strawberry Frosted Sheet Cake along with the crumble bars, sponge cake and a few other desserts for the summer tea party I threw which you can read about it HERE. It’s made in this 9×13 cake pan I received from KitchenAid back in June and it was the perfect size for sharing with a crowd. 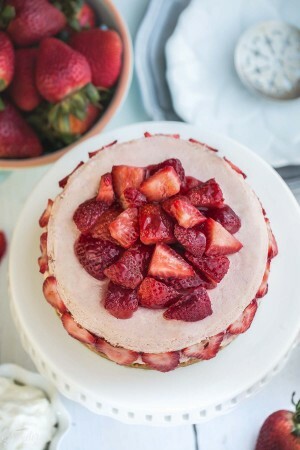 The cake is unbelievably light, tender, moist and bursting with fresh strawberry flavor. The whipped cream cheese frosting is super light and adds the perfect sweetness to complement the cake. 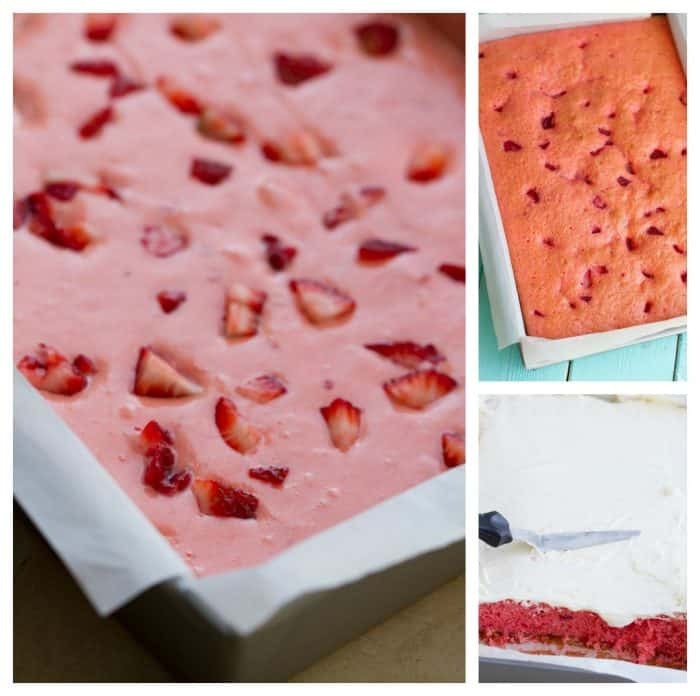 There is no strawberry gelatin powder added like most strawberry sheet cakes and is made completely from scratch. I used fresh and freeze-dried strawberries that I blended into powder using my coffee grinder to brighten it up the color. If you can’t find any freeze-dried strawberries – you can also a drop or two of food color to add some color if you like but feel free to leave it out if you prefer. The fresh fruity flavor makes it a nice and light dessert and is sure to be a hit at any potluck, shower or summer party. 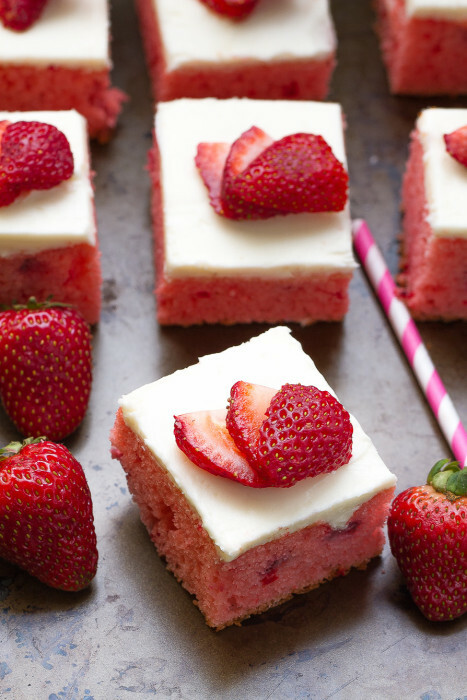 Strawberry Frosted Sheet Cake is a light and fluffy strawberry cake made from scratch. 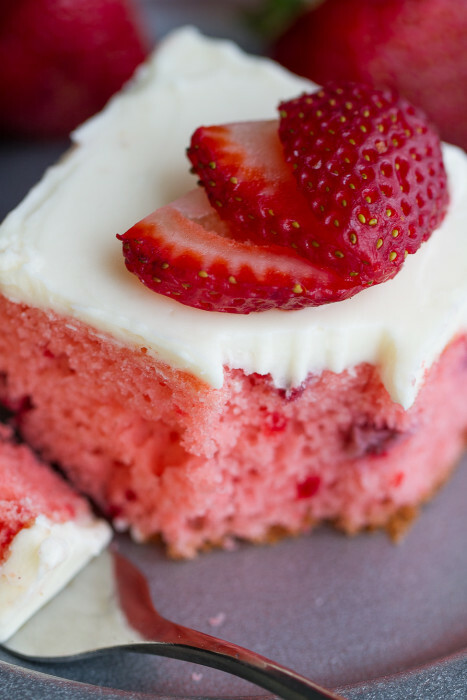 It's full of fresh strawberries and topped with a cream cheese frosting. Preheat oven to 350° F. Line a 9X13 baking pan with parchment paper leaving an overhang and set aside. Sift flour, baking powder, baking soda, salt and freeze dried strawberry powder together and set aside. Cream butter and granulated sugar until light and fluffy (about 3 minutes) in a large bowl using a mixer set at medium-high speed. Add strawberry puree and eggs, one at a time, blending each addition thoroughly. Scrape down sides of bowl and beat in vanilla extract and optional food coloring. Reduce mixer speed to low and add the flour mixture by thirds, alternating with the buttermilk and ending with a final addition of the dry ingredients. Fold in diced strawberries. Pour batter in prepared pan and bake on the middle rack of oven until a tester inserted in the center of each cake layer comes out clean -- about 25 to 35 minutes. Cool in pan for 30 minutes then lift cake out with parchment paper and cool completely on a wire rack before topping with frosting. 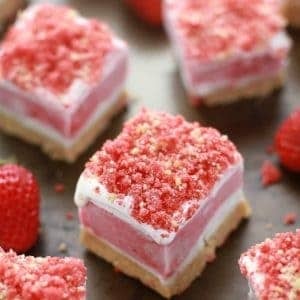 Slice into squares and top with strawberry slices before serving if desired. In a large bowl with a hand mixer (or in a stand mixer) cream butter until light and fluffy (about 2 minutes). Add softened cream cheese and beat until smooth and no lumps remain. Add the vanilla and mix well. Turn mixer on low and slowly add the powdered sugar and mix until smooth. Add 1 tablespoon of heavy cream and turn mixer back to medium and mix until light and fluffy. Add additional heavy cream or powdered sugar to reach desired consistency. Frost on cooled cake using an offset spatula. Buttermilk Substitute: Add 1 tablespoon vinegar to a measuring cup. Fill the measuring cup up with milk until it reaches the 1 cup line. Let sit 5 minutes or until mixture looks slightly curdled. You can also use lemon juice. Cake Flour Substitute: For every cup of flour you need to substitute do this: Measure out 1 cup of all-purpose flour. Remove 2 tablespoons of all-purpose flour and return to your flour bag. Replace the removed flour with 2 tablespoons of cornstarch. Sift the flour several times to incorporate the mixture completely. Disclosure: I created this post in partnership with KitchenAid and received the mixer and bakeware for recipe testing purposes as part of a Summer Afternoon Tea Party series. As always, all opinions are 100% my own.